Last night was my first class in flowers and cake design working with fondant and gum paste. All that awesome shaping and molding you see on professional cakes is mostly done using these two mediums. Gum Paste is used for most flowers, especially those that are thin and are ruffled and molding animals/people/shapes. It dries REALLY fast too. Fondant is mostly used to cover cakes and cut-outs and stays soft longer for precision placement on frosting. What we covered in the first class is in the RED BOLD text. We were taught how to prep, tint and rollout our gum paste. Also, ever wonder how they get all the pieces to stick together in more complex applications? You use your gum paste and a little water to make gum paste glue. Finally, we prepared a cornstarch and powdered sugar mixture to keep our designs from sticking to our molding cups. It was then time to jump in. 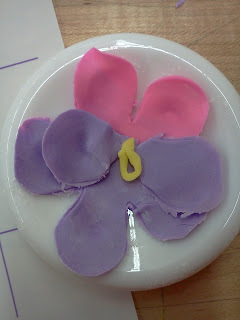 We first tackled the Button Flower as seen on this adorable cake from Wilton’s website. Yeah, I was impressed with myself that I managed to make it look this good on my first try. I made the purple press and a friend of mine did the pink. We then switched some pieces to make our button flowers multi-colored. Next we tackled the Pansy that was supposed to look like the ones on this cake from Wilton’s website. And this was my second try. My first try was marred by gum paste that was already starting to dry out. I was told it still looked close, but I was too embarrassed to even show the rest of the class… let alone take a picture of it for this blog. So I revived the gum paste with a teeny bit of shortening and gave it another whirl. The difficult part about this flower is making the ruffled leaves, although reading the book, our instructor did some of the steps out of order. I’m going to follow her example because she’s the expert and as a former instructor for a software company, I know that often there are multiple ways to do a task... all that work just fine with none of them being "wrong". Last, we made our first parchment bag. A task that I didn’t think would be terribly difficult, until I actually tried it. 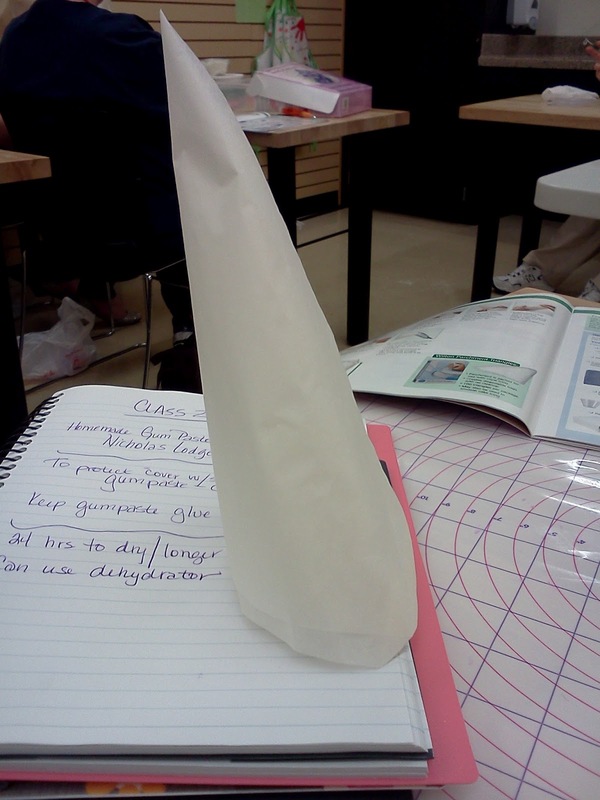 The goal is to make the cone with little to no opening at the bottom. Why? Because you can use the parchment bag just like the featherweight bags or disposable bags – with a coupler and/or tips. We touched on how to make Royal Icing which is to say we went over the recipe. That is part of our homework for next week, to make two batches, some tinted, and bring them to class. Next week we get down to serious business making Rose Bases and Centers, Apple Blossoms, Primroses and Rosebuds. And of course tonight is my first Gum Paste and Fondant class. I’m hoping now that I know the basics, I’ll be able to jump right in. I’ll let you know how it all goes tomorrow.